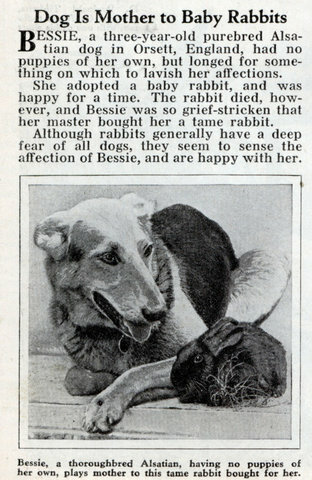 BESSIE, a three-year-old purebred Alsatian dog in Orsett, England, had no puppies of her own, but longed for something on which to lavish her affections. She adopted a baby rabbit, and was happy for a time. The rabbit died, however, and Bessie was so grief-stricken that her master bought her a tame rabbit. Although rabbits generally have a deep fear of all dogs, they seem to sense the affection of Bessie, and are happy with her. Cute as hell, until she eats the rabbit. And now that dog is dead.